One of the two distance signs heading south from Narrabri. Oct 2004. In 2013, RMS will be implementing a new alpha-numeric route numbering system. For more information, visit the RMS Website. Note: The National Route 37 shield is continuous across the Oxley Hwy, Newell Hwy and Castlereagh Hwy sections, however the Kamilaroi Highway name is not. National Route 37 is a 602km long route stretching from the New England Highway to the Mitchell Highway, following the newly-proclaimed Kamilaroi Highway. The route shield itself has had in interesting history. Not included in the original 1950s NAASRA plan for the National Route system, National Route 37 was introduced by the Department of Main Roads in 1974 - the same year several other new additions to the National Route system were made (41, 44, 48, 52 & 58). Unlike the other National Routes that made their debut in 1974, National Route 37 is actually located in sequence (i.e. east of 39). Following the proclamation of the Kamilaroi Highway as State Highway No. 29 on 13 February 1999, National Route 37 was extended along the newly-proclaimed highway to Bourke, via short duplexes with the Newell Highway (through Narrabri) and the Castlereagh Hwy (in/north of Walgett). The National Route 37 shield is continuous across these other highways whilst the State Highway No. 29 classification is not. Prior to the proclamation of the Kamilaroi Highway, National Route 37 between Willow Tree and Oxley Hwy, and from Oxley Hwy to Newell Hwy, was Main Road No. 72 (earlier Trunk Road No. 72). West of Narrabri, Main Road No. 141 extended to Wee Waa from where two more insignificant main roads took travellers to the Castlereagh Hwy about 5km north of Walgett. 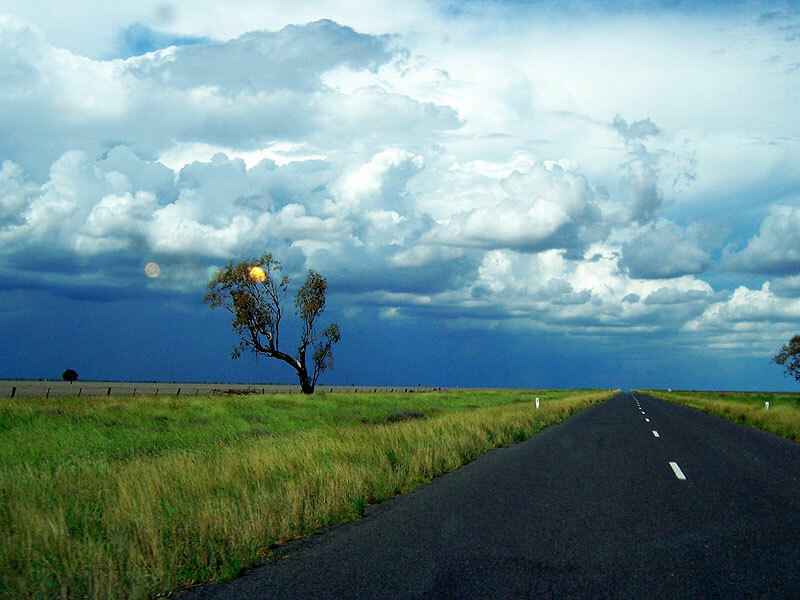 Between Walgett and Bourke, the route of the highway was formerly part of the once-legendary Trunk Road No. 68 which, in its prime, stretched from the Queensland Border near Mungindi to the South Australian border about 100km west of Wentworth. The proclamation of the Kamilaroi Highway on 12 February 1999 was part of an effort to improve access to/from north-west New South Wales and a gesture of acknowledgement to the Kamilaroi people, the traditional land owners of the area. An official naming ceremony took place in Leith Park, Narrabri, on Saturday February 13, 1999, where the Minister for Transport, Carl Scully, unveiled a plaque naming the highway. According to this Australasian Bus News article, a total of 72 name plates reading "Kamilaroi Highway" have been installed along the length of the highway "so motorists travelling the highway in the years to come will know that they are travelling through Kamilaroi country". Too bad the Government didn't spend any money on decent signage and anyone trying to follow the highway would probably find themselves hopelessly lost once the National Route 37 shield and the Kamilaroi Highway signs disappear in several places. Luckily, focal point signage (dating from the Department of Main Roads' time) is fairly adequate. In order to bring the Kamilaroi Highway up to an appropriate standard, a lot of work needed to be be done west of Narrabri. In December 2003, bituminous sealing of the last 64km long unsealed section between Walgett and Brewarrina was completed, thus in effect completing the highway. Also as part of the upgrade of the highway, a new route to take through traffic (particularly trucks en route to the grain terminals at Narrabri) away from Wee Waa town centre was constructed. The new route of the highway skirts the northern edge of the town. However, work did not stop there, with the replacement of the last two remaining single lane bridges on the highway - the most notable being the bridge over the Barwon River at Brewarrina - completed in mid-2004. 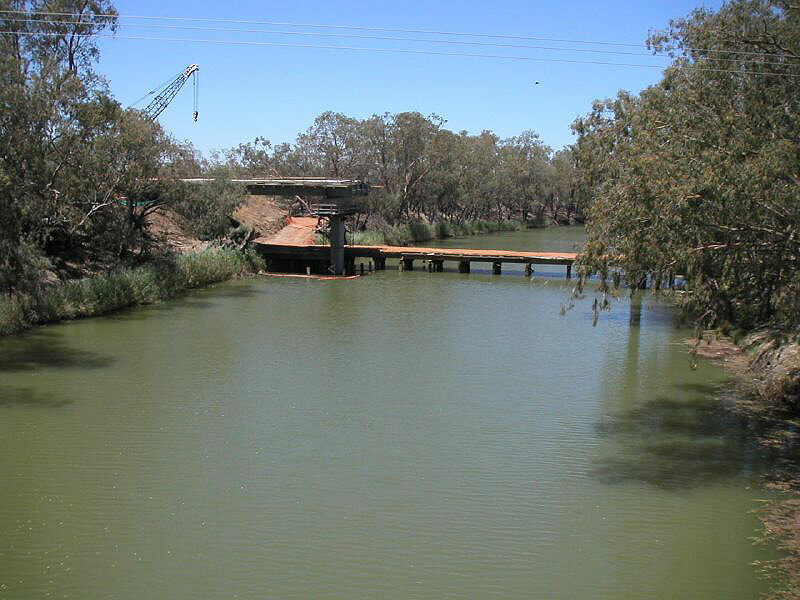 The old bridge at Brewarrina was an Allan Truss timber structure with an antiquated lift span, opened by manual labour. It was opened on 7 December 1888 and is the second oldest lift bridge in New South Wales. Its replacement was necessitated not because it was nearing the end of its useful life, but by damage sustained to the lift span in July 2000. The bridge is heritage listed by the RTA's Environment and Conservation Branch so it should be retained for preservation as one of only two remaining original-type lift bridges in New South Wales. More on the bridge can be read on the RTA's website here. AD sign northbound on New England Highway approaching the beginning of Kamilaori Hwy & NR37, 2km north of Willow Tree. Oct 2004. AD sign southbound on New England Hwy approaching the beginning of Kamilaroi Hwy & NR37, 2km north of Willow Tree. Oct 2004. Looking southeast along Kamilaori Hwy to its terminus at the New England Hwy. Note the horribly non-standard sign with incorrect NR15 shield. 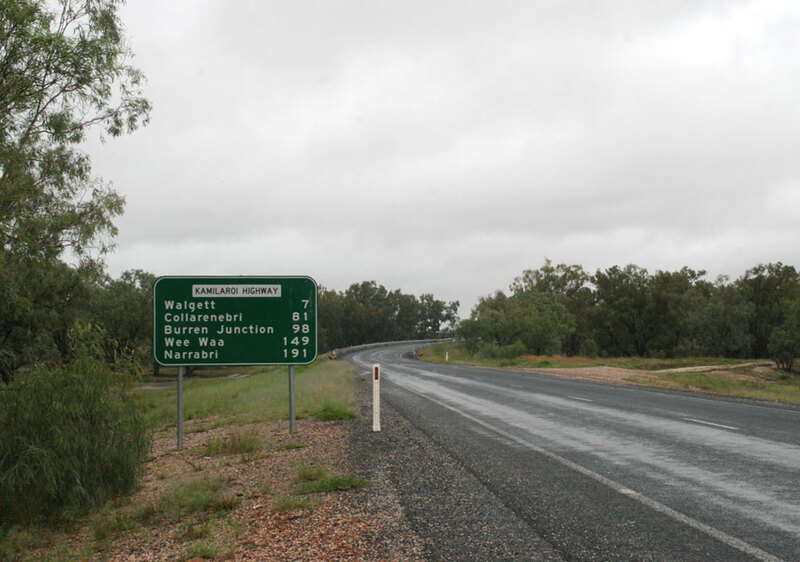 Also note there is no distance sign for Kamilaroi Hwy traffic heading away from New England Hwy :-( Oct 2004. Looking north between New England Hwy and Quirindi. Oct 2004. Distance sign heading south from Quirindi. Oct 2004. Looking east along Lennox St approaching Loder St in Quirindi. 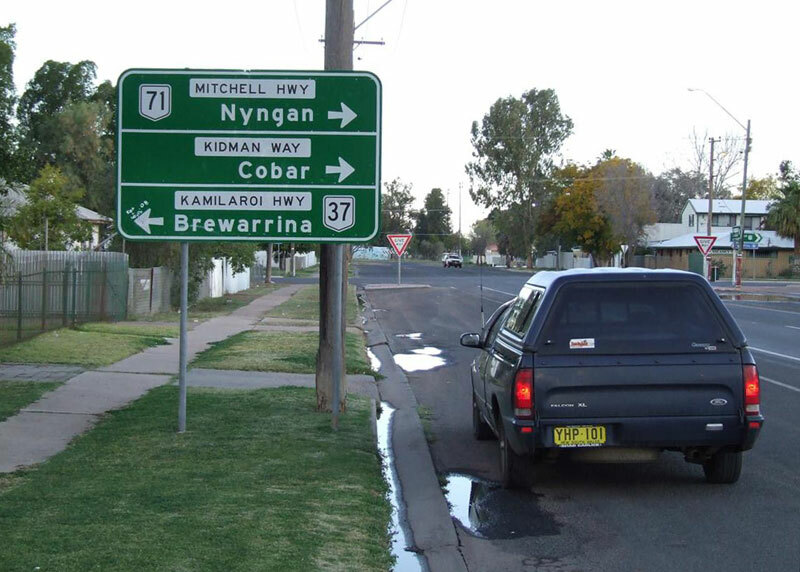 Note the dodgy application of a "Kamilaroi Hwy" name plate. Oct 2004. Distance sign heading west from Quirindi. Oct 2004. More dodgy signage, this time a non-standard double-chevron ID sign without a National Route 37 shield, 5km northwest of Quirindi. Oct 2004. Again no NR37 shield, this time on an AD sign for the Pine Ridge/Blackville turnoff. Also note the dodgy application of a "Kamilaroi Hwy" nameplate. Oct 2004. Remnant black AD sign on the Quirindi-Coonabarabran road approaching Kamilaroi Hwy, 9km north of Quirindi. Oct 2004. Very non-standard distance sign heading north from the Quirindi-Coonabarabran road. Oct 2004. Interesting, but very poorly designed, diagrammatic AD sign heading east on Gap Rd approaching the Kamilaroi Hwy 13km south of Breeza. Note the very dodgy application of the 'Kamilaroi Hwy" name plate which makes you think the highway goes to Caroona rather than Quirindi or Gunnedah. Oct 2004. Southbound AD sign approaching Gap Rd. This time a very well designed sign is spoilt by the incorrect shield. Oct 2004. Looking north into Breeza alongside the Werris Creek-Moree railway line. Oct 2004. More dodgy signage, this time at the turnoff to Spring Ridge in Nea. Note the missing NR37 shield, the double-chevron ID sign which is acting as a fingerboard and the awful-looking after-thought of a distance to Spring Ridge. Oct 2004. Looking north throguh empty fields near Curlewis. Oct 2004. Another non-standard distance sign, this time heading south from the Oxley Highway near Gunnedah. April 2006. Northbound AD sign approaching the Oxley Highway junction, 2km south of Gunnedah. April 2006. Heading west along Oxley Highway approaching the NR34/NR37 duplex at Gunnedah. Note the missing NR37 shield (right hand side of sign). Oct 2004. Well-designed fingerboard signage on the Oxley Hwy (NR34/37 duplex) between Kamilaroi Hwy and Gunnedah. However, the sign is missing a NR37 shield and "Narrabri" should probably not be included as a focal point considering NR37 doesnt even rate a mention on the actual sign. Oct 2004. AD sign westbound on Oxley Highway (Conadilly St) approaching the Kamilaroi Highway junction in Gunnedah. April 2006. Heading north along Abbott St (Oxley Hwy) approaching Conadilly St (Kamilaroi Hwy/Oxley Hwy) in Gunnedah. Oct 2004. Heading east along Conadilly St (Kamilaroi Hwy) approaching Abbott St (Oxley Hwy) in Gunnedah. As you can see the NR34/37 duplex is very well signed at this crucial intersection. Oct 2004. Looking east along Kamilaroi Highway (Conadilly St) towards Marquis St in Gunnedah's CBD. April 2006. Another eastbound view of the Kamilaroi Highway (Conadilly St) through Gunnedah's CBD. The construction work on the left is part of main street beautification work being undertaken by Gunnedah Shire Council. April 2006. Black distance sign heading north from Gunnedah. April 2006. Disgraceful non-standard sign at a turnoff 3km north of Gunnedah. Oct 2004. Another variation on breaking the RTA's sign design guidelines, this time 3km south of Boggabri. Note that originally no distance shown fro Gunnedah - the 36 appears to be a late addition to the sign. Oct 2004. 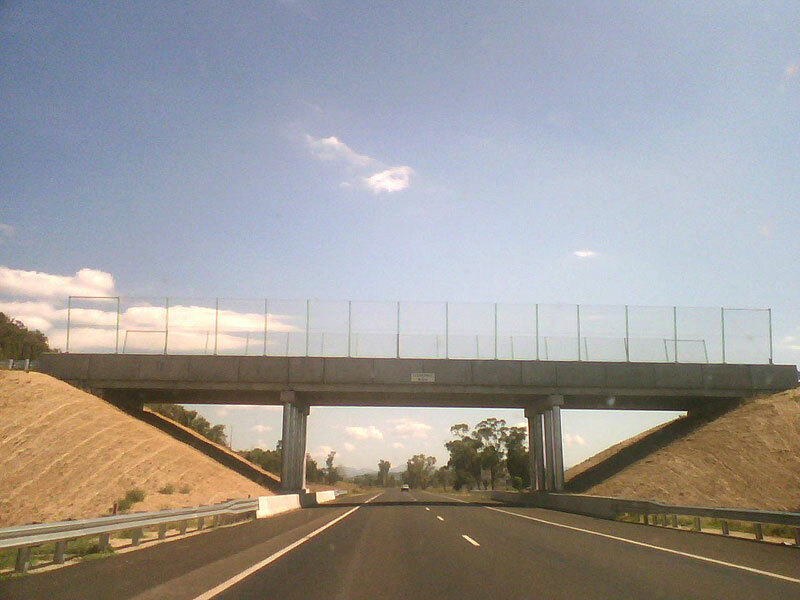 Kamilaroi Highway looking south at an overpass constructed to carry a new coal haulage road across between Boggabri and Baan Baa. Source: Michael Gill, January 2007. One of two distance signs heading south from Narrabri. Oct 2004. Roundabout diagrammatic AD sign heading north on Newell Highway approaching Kamilaroi Hwy at Narrabri. Oct 2004. Replacement of the bridges over Eathers Creek and Lagoon Creek underway at Narrabri. Oct 2004. Old black ID sign (dating from at least the 1970s) at the intersection of Tibbereena St and Dangar St in Narrabri. Note there is no mention of NR37 (which you wouldn't expect considering the sign's age but why hasn't somebody replaced it?). Oct 2004. Distance sign heading north on Tibbereena St (Newell Hwy, NR37/NH39) in Narrabri. Note no mention of NR37. Oct 2004. Newell Highway southbound approaching Kamilaroi Hwy on the north side of Narrabri. Note the well designed sign but the incorrect NR39 shield and missing NR37 shield straight ahead. Oct 2004. Kamilaroi Hwy eastbound approaching Newell Hwy on the north side of Narrabri. Note the incorrect NR39 shield and no mention of where NR37 goes (right). Oct 2004. Distance sign heading west from Narrabri along Kamilaroi Hwy. Note the new name plate but no mention of National Route 37. Oct 2004. Kamilaroi Highway between Wee Waa and Walgett is long and straight, with no edgelines, as shown in the this view west of Burren Junction. Source: Michael Gill, January 2008. Distance sign heading east from the Castlereagh Highway junction just northeast of Walgett. Note there is no mention of National Route 37 but there is Kamilaroi Highway name plate. April 2006. Non-standard ID signs acting as fingerboards at the junction with Castlereagh Hwy, 5km northeast of Walgett. April 2006. Castlereagh Highway southbound approaching Kamilaroi Highway, 5km northeast of Walgett. April 2006. Castlereagh Highway northbound approaching Kamilaroi Highway, 5km northeast of Walgett. April 2006. Castlereagh Highway (Fox St) northbound approaching Kamilaroi Highway (Wee Waa St) in Walgett. Note no mention of NR37 (like most other signs in the Walgett area) or NR55. April 2006. 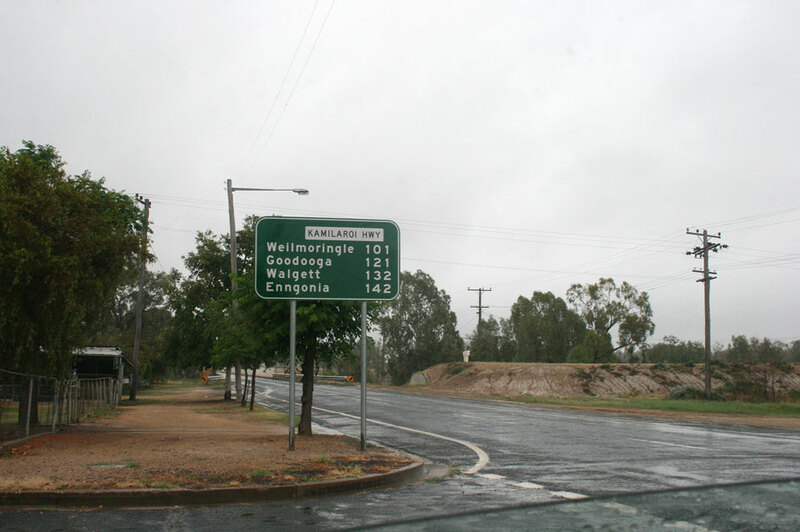 Black ID sign missing a NR37 shield at the junction of Castlereagh & Kamilaroi Highways in Walgett. April 2006. Kamilaroi Highway (Wee Waa St) eastbound approaching Castlereagh Highway (Fox St) in Walgett. Note the "B55" shield but no shield to replace NR37! April 2006. Looking east along Kamilaroi Highway (Wee Waa St) through Walgett. April 2006. Unusual fingerboard sign with an all-caps coverplate, at the junction of Kamilaroi Highway (We Waa St) and Peel St, Walgett. April 2006. Distance sign heading west from Walgett. Note the "B76" shield. April 2006. Looking west between Walgett and the Barwon River bridge. This is typical road quality of the Kamilaroi Highway in this area. April 2006. The former alignment of Kamilaroi Highway on the southern approach to the old bridge over the Barwon River. The immediate approaches to the bridge and the bridge itself have both been removed and the southern leg of the old highway is now part of a local road - Brewon Rd. April 2006. "B76" fingerboard sign at the junction with Brewon Rd. April 2006. Looking south across the Barwon River, 6km west of Walgett. April 2006. Brand new RD sign - strangely missing a B76 shield (it's not surprising there's no NR37 shield either, given the RTA's track record) on the approach to the Barwon River bridge, 7km west of Walgett. Source: Nathan Johnston, December 2008. AD sign heading north on Kamilaroi Highway approaching the junction with Main Road No. 402 (Walgett-Cumborah-Lightning Ridge). Note there is no mention of National Route 37, despite the sign being relatively new. April 2006. Very old AD sign southbound on Main Road No. 402 approaching Kamilaroi Highway. Also note the very old intersection warning sign. April 2006. Non-standard sign assmebly facing eastbound Kamilaroi Highway traffic at the junction with Main Road No. 402. April 2006. Looking west from the junction with Main Road No. 402 - there was no distance sign. April 2006. 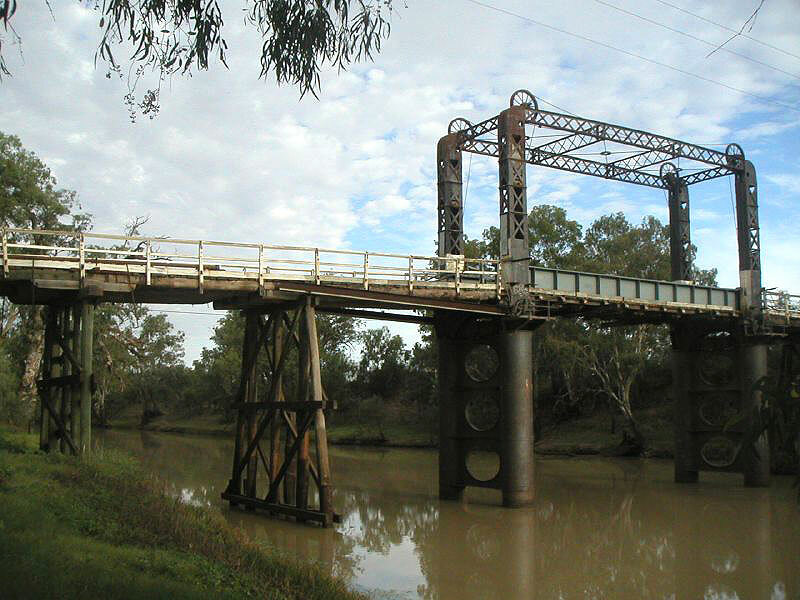 Two photographs showing the old bridge over the Barwon River at Brewarrina, which was replaced in 2003/04. 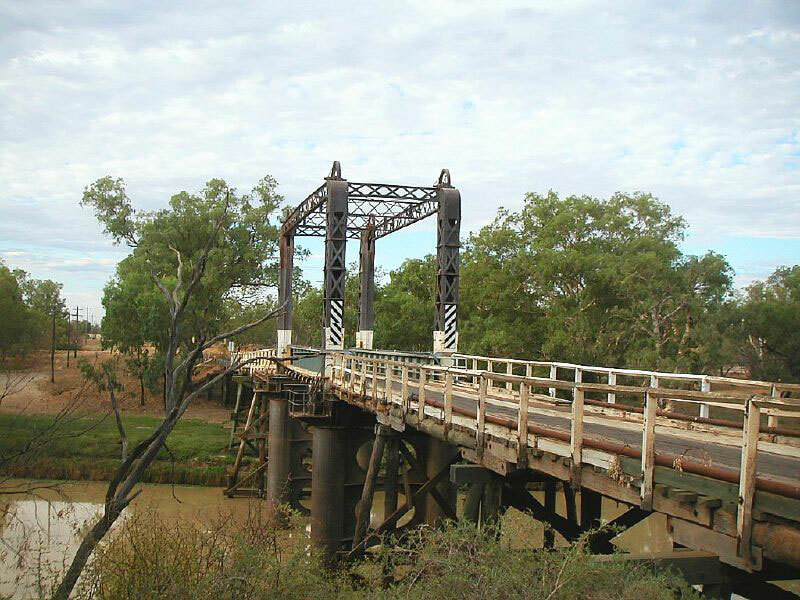 A view from the old bridge over the Barwon River at Brewarrina showing the replacement bridge under construction during 2003/04. Distance sign heading east from Bourke along Kamilaroi Highway. Quite unusual and disappointing that there are not more focal points considering this is the beginning of a 600km long highway. Jan 2005. Brand new RD sign - installed in preparation for the introduction of alpha-numeric route marking in NSW - heading east from Mitchell Highway, Bourke. Note the incorrect use of a blank coverplate instead of a NR37 coverplate. ID sign pointing traffic down Kamilaroi Highway from Mitchell Hwy in Bourke. Note the missing National Route 37 shield. Jan 2005. AD sign on Mitchell Hwy southbound approaching the beginning of Kamilaroi Hwy, Bourke. A very poorly designed sign but at least it has the NR37 shield and the highway name. Source: Richard Wardle, September 2008.